This listing features this gorgeous, Hand Crafted Agape Crystal and color enhanced Smokey Goddess Window Crystal in a Sterling Silver Pendant that measures 2 5/8x1/2" at its widest, including the bail. 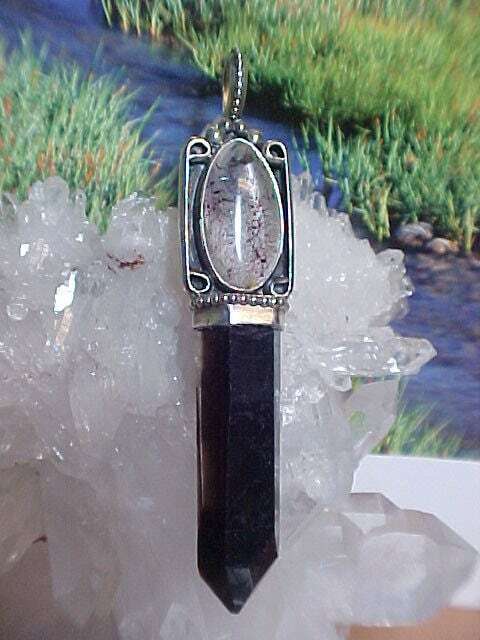 Fabulous for bringing Insight into and a Focus upon the Divine Feminine energies, especially Unconditional Love, when we take a closer look at the beautiful Agape, we see that it is predominantly a light Smokey Quartz with a wonderful dispersion of ruby-red splashes of Lepidocrocite, fine filaments of Silver and Black Rutile. The Smokey Quartz Crystal bears an elongated, 5-sided Goddess face with an incredible Window into the potential Future. Handsomely placed into this Sterling Silver setting by Dino, you will receive the exact pendant featured here, along with a purple keep-sake bag, a postcard photo of our Agape Crystals being bathed in crystal artesian spring water, and a signed certificate as our promise that you have purchased a genuine Agape Crystal pendant. "Agape Crystals (which contain the energies of Amethyst, Smokey and Clear Quartz, Rutile, Lepidocrocite, Cacoxenite and Goethite) never need clearing or cleansing and come only from Espirito Santo, Brazil. The name "agape" comes from the Greek word meaning "an out-pouring of unconditional love". Agape Crystals are associated with the Divine Feminine energies such as unconditional love, compassion, forgiveness, and healing, to name a few. The "brotherhood" of minerals contained within these crystals is not unlike our brothers and sisters of our Native American Medicine Wheel, all sharing their energies and gifts with their human companions to help them on their paths to spiritual growth and completion. They are wonderful companion crystals for "reviewing and releasing" old ways of thinking and acting which do not serve us on our paths to enlightenment. They can also help us to create a new path to allow the ways of "peace and harmony" to rule in our lives, and help us to re-focus and manifest what is needed. In addition, these Agape Crystals can aid us in awakening, stimulating, and developing our psychic abilities, including telepathy, clairvoyance, clairaudience, claircognizance and clairsentience. It should be noted here that even if some of these minerals are microscopic and not eye-visible within the stone, all of their properties are still within the crystal, as they are all indigenous to the area where these crystals are mined. Just like the minerals within Mother Earth that flow through the vine into the grape to give a fine wine its distinct flavor, so do these minerals combine to create this incredible crystal. All of our Agape Crystals have been bathed in the flowing waters of a beautiful, crystal-pure, spring-fed creek in our beloved Ouachita National Forest, near Mount Ida, AR. Agape Crystal vibrates to the master number 11, the most intuitive of all numbers, representing illumination and deep insight, as well as spiritual harmony. Smokey Quartz is Crystal that exhibits a light to dark, smokey gray color throughout the crystal, usually due to being exposed to Uranium or other natural radiation during growth. It is a wonderful companion stone for those who seek grounding and centering, enhancing focus and attentiveness to the moment. In addition, Smokey Quartz is an excellent choice for those seeking to promote creativity and good business acumen within all relationships in their lives. It is a wonderful companion stone for those who are under a lot of stress, and it has also been reported that Smokey Quartz has shown itself to be quite beneficial in helping the body to fight the growth of the free-radical in cancer and other diseases. Window Crystals have "diamond shapes" which connect four facet lines and can act as a "portal" to knowledge from other dimensions. It is said that a Window on the right side of the face connects one with the future, and a Window on the left, with the past. Windows are a wonderful companion stone for those who seek wisdom and enlightenment from the spiritual realms. They are a great "facilitator" of meditation, and can aid in the cooperation and communication with other beings and other worlds. Window Crystals act as a window to your soul and teach us the value of introspection and to go within for the answers we seek, for the "All Knowing God Spark" within us is our true guru. Silver is a wonderful complement to those who wish to promote patience and perseverance in our lives. It is an excellent tool for giving one "the advantage" in all aspects of competition, and helps to enhance perception, and emotional and intuitive energies. Silver is a terrific choice for those who seek to bring an "eloquence" to their communication skills, and it is also the grounding mineral for those born under the sign of Aquarius."